The BBC has put together this brilliant Dog Map for the UK from 10 years of data from microchipped dogs. The study was compiled using data from Petlog and Animalcare and included 5 million dogs (about 60% of all dogs in the country). 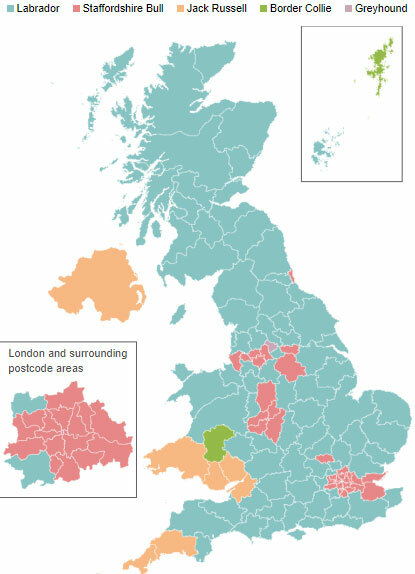 The BBC has produced an interactive map of the UK showing the most popular dog breed by region. The study has highlighted some interesting facts. For instance, the Shih Tzu is most popular in Liverpool and the Greyhound in Halifax, whereas on the Scottish borders and in Cornwall, Border Collies and Labradors are most popular. The study revealed that more than 509,000 Labradors has been chipped over the last decade, meaning they come out on top as Britain’s favourite dog. Second place was taken by the Jack Russell Terrier, with over 376,000 chips and the Staffie was third with 356,000. 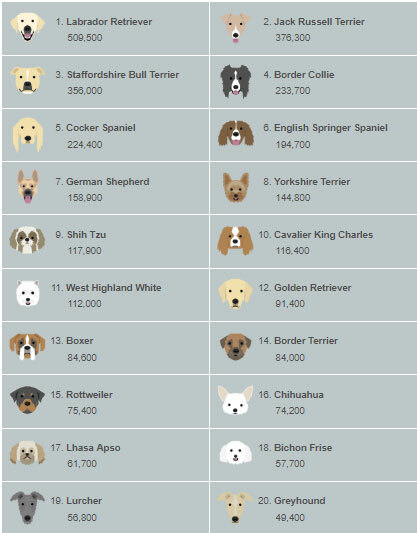 Below is a graphic by the BBC showing the top 20 most popular dogs in the UK and the numbers included in the study.